Saint Martha in her kitchen. Vincenzo Campi, 16th centiury. Perhaps the CTA should consider adding a seasonal express line from 20 N. Wacker to 220 S. Michigan. For the second time this season, a conductor engaged in performances at the Lyric Opera is concurrently leading the week’s Chicago Symphony Orchestra concerts. Sir Andrew Davis did the podial double-duty in October and Thursday night it was the turn of Markus Stenz, the conductor currently in the Lyric pit for Janacek’s Katya Kabanova. Mahler and Mendelssohn shared the CSO program and few composers make a more companionable contrast. The light-hearted spirit and high-gloss craft of Mendelssohn’s music is a particularly fine foil for Mahler’s neuroses, wry darkness and angst-ridden drama. But this week we are hearing Mahler’s Symphony No. 4, the happiest and least tortured of the Austrian composer’s works, which, even with its passing shadows, breathes an atmosphere of quirky humor and relaxed contentment in its journey toward transcendent innocence. Stenz deployed the orchestra in unorthodox alignment with violins outside split left and right, violas right center, and cellos inside left with double-basses behind. That produced a warmer, more burnished sound with Stenz drawing highly focused balances and concentrated playing from the musicians. The German conductor is clearly a Mahlerian to be reckoned with, though his interpretive stance is difficult to pigeonhole. In the expansive opening movement, Stenz brought ardent richness to the lyrical second theme but his fleet, mobile style almost seemed to be playing down Mahler’s weirdness and grotesquerie, the opening sleigh bells sounding almost like an apologetic throwaway. Yet in the steep rallentando at the first movement’s coda and in the ensuing Scherzo, Stenz out-Bernsteined Bernstein in his extreme tempo fluctuations and hairpin dynamic turns. Robert Chen’s elegant tuned-up violin solo missed the harsh diablerie Mahler was clearly aiming for, yet—some shaky first-horn playing apart— rarely will one hear the sardonic humor and strange wind writing emerge with such character and panache as here. The slow movement provided the right beneficent glow, with beautifully refined string playing, Stenz directing at an understated, flowing tempo. As is so often the case in this work, the vocal finale painting a child’s view of heaven as a sumptuous feast didn’t quite come off Thursday night. Nicole Cabell has the right youthful soprano, but lacked the radiant spirit for the Das himmlische Leben text. Reading from a score—unprecedented in my concertgoing experience for this brief assignment—Cabell seemed far too coy and worldly, more like a flirtatious Musetta than a reflection of childish innocence. Her hushed rendering of the final lines had the requisite tender solace, however, and Stenz and the orchestra provided rarefied pianissimos, the quiet coda and following silence mercifully unbroken by the previously bronchial audience. 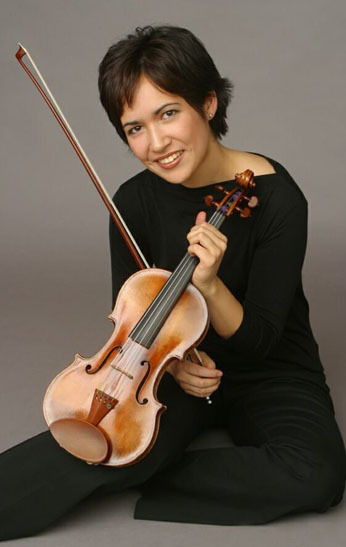 The Mahler was preceded by Mendelssohn’s not unfamiliar Violin Concerto with Viviane Hagner making her downtown CSO debut. The German violinist has a sweet tone and an intimate style well suited to the work’s songful lyricism. The Andante was rather cool, flowing and graceful rather than heart-touching, yet Hagner’s communicative performance was otherwise hard to resist. The soloist clearly is not lacking in quicksilver bravura with her lightning finale striking notable sparks, some brief errant intonation apart. Stenz and the CSO provided full-tilt support on the same high level with the conductor uncovering a wealth of wind lines normally buried by less attentive hands. The program will be repeated 8 p.m. Saturday. Also there will be two Behind the Score Mahler 4 events with Gerard McBurney at 1:30 p.m Friday and 3 p.m. Sunday. www.cso.org; 312-294-3000. Viviane gave a breathtaking performance, as did everyone on the whole. I have to disagree about the rarity of Miss Cabell using a score. I’ve seen artists use scores many times, so what’s the big deal? She delivered a spirited, beautiful performance, never burying her nose in said score. Just because Mr. Johnson happens to find this unusual doesn’t mean it is. Excellent concert and a spot-on review. After experiencing his Lyric Katya and CSO Mahler, I’ve become enough of a Markus Stenz fan to try and catch his Schumann with the Civic Orchestra this Tuesday. While I don’t begrudge vocal soloists the use of a score (although yes, this was a single movement, not an oratorio), rather than singing angel-style from a score held out in front of her, Ms. Cabell sang dress rehearsal style turning pages of the score on a music stand in front of her. Stylistic nitpicking of the pickiest kind, to be sure – but given the pains that Mahler goes through to elevate us en masse to this moment of heavenly bliss, this small detail was a needless worldly distraction. I’ve seen a lot of singers use music just in this style (and in this piece) before. I never thought it was strange, but a lot of people need to criticize something, so there you go. Someone needs to have told the Three Tenors that using music in concert is a distraction (and Susan Graham, Renee Fleming, Margaret Price, among others who I’ve seen use music stands in concert in much less appropriate pieces). Every reviewer has an opinion, as you’ll see if you look at the other reviews for this concert, which are very different than this one. The reviewer wouldn’t be doing their job if they didn’t search for flaws, but it is, after all, just an opinion.